... and while spreads remain compressed - which is understandable in a world where any outsized yield is fiercely bought by managers of "other people's money" regardless of the underlying fundamentals - yields continue to creep higher, tracking the broader rates market, and it is only a matter of time before America's highly indebted, "zombie" corporations most of which are rated somewhere in deep junk territory, hit their tipping point and trigger a mass default avalanche. ... something we first showed during the brief but acute 2016 E&P junk bond crisis. But besides that technicality, Moody's is - for once -correct, and in a surprisingly dour assessment of the high yield market, Buffett's favorite rating agency warns that while the near-term outlook for credit remains "benign," that won't be the case when economic conditions worsen. In the report Moody's senior credit officer, Mariarosa Verde, writes that "the prolonged environment of low growth and low interest rates has been a catalyst for striking changes in nonfinancial corporate credit quality," and adds that "the record number of highly leveraged companies has set the stage for a particularly large wave of defaults when the next period of broad economic stress eventually arrives." She also notes that while the current high yield default rate is just 3%, it has been rising rapidly in recent months as shown in the chart below, and furthermore this artificially low default rates is predicated on favorable conditions that may will not last. And here is a striking statistic from Moody's: since 2009, the level of global nonfinancial junk-rated companies has soared by 58% representing $3.7 trillion in outstanding debt, the highest ever, with 40%, or $2 trillion, rated B1 or lower. Putting this in contest, since 2009, US corporate debt has increased by 49%, hitting a record total of $8.8 trillion, much of that debt used to fund stock repurchases. 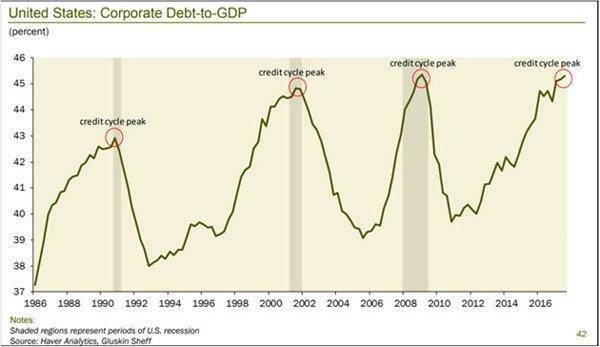 Meanwhile, as a percentage of GDP, corporate debt is at a level which on ever prior occasion, a financial crisis has followed. Furthermore, in the post financial crisis period, there has been a steady deterioration in debt issuance, with the share of investment-grade firms declining while junk-rated debt has increased. "Strong investor demand for higher yields continues to allow all but the weakest issuers to avoid default by refinancing maturing debt," Verde wrote. "A number of very weak issuers are living on borrowed time while benign conditions last." And here is Moody's as close at it will ever go to slamming central banks for being responsible for the next debt crisis. As paraphrased by CNBC's Jeff Cox, it is the easy credit conditions of the past decade that have allowed lower-rated companies to flourish and go to market, as global central banks have kept rates low while flooding the world with trillions in excess liquidity. To be sure, there is a good side to this artificially extended existence: it has allowed some smaller firms, which otherwise would not have survived , to implement game-changing technologies into multiple industries, particularly energy. Yet concurrently higher-rated companies have been issuing record amounts of debt, which they used to reward shareholders with buybacks and dividends. As a result, their debt, while still investment grade, has fallen to just a few notches about junk, with the very top of the ladder shrinking from 21 percent pre-crisis to 14 percent currently. Here Moody's, like Bank of America recently, warned that the trend will result in a surge in "fallen angels," as investment grade companies are downgraded to junk, which incidentally Horseman Global recently said will be his favorite short this year. Meanwhile, median debt to EBITDA levels have risen 30% for investment-grade companies and slightly less for junk, which means that an even smaller increase in rates will be sufficient to lead to mass defaults. "For many speculative-grade issuers, debt capacity may have reached its limit but structural protections continue to weaken," Verde said. 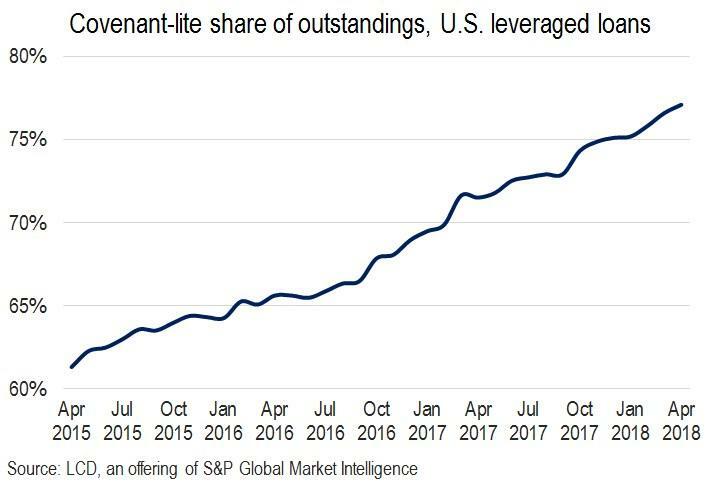 "Many of these highly leveraged borrowers have more latitude than at any other time in the past to engage in potentially credit-eroding activities such as asset sales or debt-accretive transactions without needing to get lender consent." The moody's analyst also noted that it is only thanks to central bank intervention that lower-rated companies have managed to keep their defaults below the historical average even though their credit metrics are "deeply stretched." "This extended period of benign credit conditions has helped many weak, highly leveraged companies to avoid default. These companies are poised to default when credit conditions eventually become more difficult." Which incidentally, is precisely what the IMF warned one year ago, when it predicted that 20% of all US corporations are at risk of default once rates rise, as they have been for the past year. In fact, as the IMF chart below shows, some $3.9 trillion in corporate debt is at risk of defaulting when rates rise enough. The only question is what is "enough?"